For most people listening is something that comes naturally and easily and is performed everyday without even being particularly aware of it. The learning environment is one area in which listening is key to being able to remember information which will be used during exams and tests, especially those that require the student to recall a lot of factual data.For others these sessions and environment do not provide the most effective learning surroundings and many factors may interrupt or influence the persons ability to learn. What Is An Auditory Tool? There are many interpretations of this term and an auditory tools may be something as simple as a nursery rhyme or chanted song, or can be a technical device used to enhance the learning of the individual by altering the way in which sounds are heard and interpreted. This may be that background noise is removed or that certain sounds are amplified in the individual’s ear. Talking clocks and calculators and other such equipment can all be considered auditory tools as they help to convey information by sound and encouraging listening skills, and are used by blind people regularly as they rely on their other senses in response to their lack of ocular vision.Essentially an auditory tool is something that is used to encourage listening and enhance learning. It is something that many teachers and parents use often without giving it a second thought. Who Can Benefit From Using An Auditory Tool? Anyone can benefit from using an auditory tool in the traditional sense as babies, young children, students and the general public seems to respond very well to changing the way in which information is delivered. Songs, chants and quirky saying are all useful for remembering information and something that we use many times during life.With regards to the specially designed devices, those with hearing difficulties, attention deficit or other disorder may benefit from using the tools.Often this equipment is designed with these users in mind and are specifically created to address the unique needs of these people. 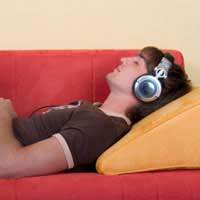 Many aim to reduce background noise, amplify the sounds or alter sound patterns. Many students rely heavily on auditory aids for assisting their revision and employ tactics such as recording the facts onto a tape and replaying them whilst lying in bed or sleeping as the information will continue to be processed by the brain.Those who have been diagnosed with some degree of deafness or have an attention deficit disorder can remarkably improve their academic ability once a problem has been identified and often these students who are often considered to be ‘difficult’ pupils can become excellent students once they are able to hear the information properly and concentrate better.The benefits of using auditory and visual aids in learning were identified a long time ago and they are now regularly used as legitimate methods of increasing learning and retaining information. If using any of these aids assists revision or learning in any way then they must be seen for their beneficial qualities and used when able to provide a suitable and effective learning environment. Auditory tools are used by almost everyone at some point in their life.The benefits of sound and learning have led to the development of special equipment that addresses the needs of those who have difficulty listening and hearing specific information and there are now products available for use by the general population that increase the amount of learning that can be achieved through sound.